At a time Gujarat government expectedly went in massively into Swachh Bharat campaign launched by Prime Minister Narendra Modi on the Gandhi Jayanti day, facts have come to light which show that the state is the worst performer when it comes to treating municipal solid waste (MSW). A Planning Commission report, prepared in May 2014, has said that while Gujarat’s urban development authorities may be collecting most of the MSW – 7,378 out of 8,336 tonnes per day (TPD) – they are able to treat just 118 TPD, which comes to a mere 1.57 per cent of the total collection. Interestingly, these figures find their place in the appendix of the report, with no explanation in the main body as to why Gujarat is such a poor performer. This is particularly shocking, as it is way below the total municipal waste treated in the country, 28.4 per cent. About 1,33,760 TDP of municipal waste is generated in India, out of which 91,152 TDP is collected, and 25,882 TDP is treated. The Swachh Bharat campaign in Gujarat was launched by chief minister Anandiben Patel from Mahatma Gandhi’s birthplace, Porbandar. In Porbandar district, significantly, out of 1.25 lakh households, 52,483 households (38,673 in rural areas and 13,809 in urban areas) – or 42 per cent – do not have any toilet facilities within their premises, according the Census of India 2011 data, which means that majority of these people go in for open defecation, forcing manual scavenging upon Valmiki Dalits. 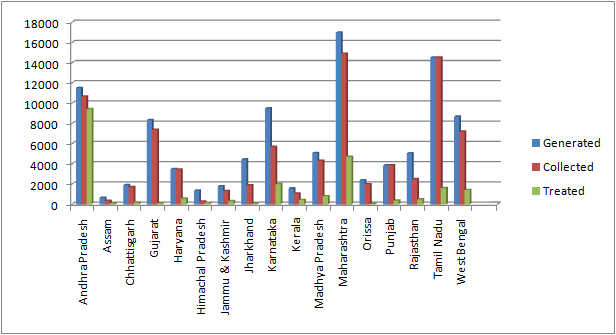 An inter-state comparison, on the basis of the data provided by the Planning Commission report, suggests that the urban areas of all major states, including the poorer ones, treat a much higher proportion of MSW than Gujarat. While Odisha performs the worst by treating just 1.25 per cent of the total 2,383 TPD of MSW generated, data for two “Bimaru” states have not been given (Uttar Pradesh and Bihar). 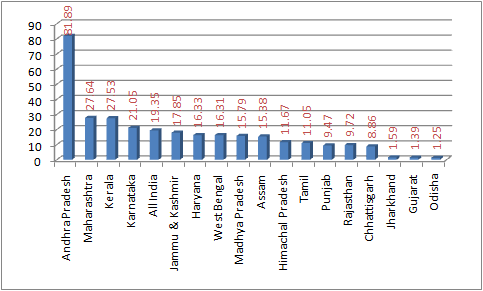 The states performing better than Gujarat are Jharkhand (which treats 1.59 per cent of 4,450 TPD), followed by Punjab (9.45 per cent of 3,853 TPD), Chhattisgarh (9.85 per cent of 1,896 TPD), Tamil Nadu (11.06 per cent of 14,532 TPD), Haryana (16.57 per cent of 3,490 TPD), and so on. The best performer, according to the data released by the high profile report, is Andhra Pradesh, which treats a whopping 88.38 per cent of the total MSW generated (11,500 TPD). This is followed by Delhi, India’s national capital, which treats 33.33 per cent of the MSW (7,500 TPD) and Maharashtra 27.65 per cent of 17,000 TPD. Significantly, the report was released about two years after the Ahmedabad Municipal Corporation got involved in an ambitious task of implementing a “zero waste policy” under an agreement with the United Nations Centre for Regional Development. Signed in 2012, it seeks to achieve zero waste by 2031.